Here's a comprehensive list of literary, book and reading festivals throughout Ireland in 2019. I've done the research so you don't have to ... all you have to do is decide which festivals to go to! *2018 dates. The dates for 2019 have not been announced yet. I’ll update this listing when they become available. If you'd like me to include your 2019 book, literary or reading festival in this 2019 list, please send me the details at info@marymccauleyproofreading.com. Thanks! Wishing all my clients, and my friends and colleagues in the editing world a very happy and peaceful Christmas. Thank you for your custom and support during 2018. Best wishes to you all for 2019! Another great year of Irish literary and book festivals stretches out before us in 2018. So whether you're a native or a tourist, start planning your festival tour now! *2017 dates. The dates for 2018 have not been announced yet. I’ll update this listing when they become available. If you would like me to include your 2018 book or literary festival in the above list, please send me the details at info[at]marymccauleyproofreading[dot]com. Thanks! 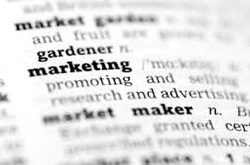 I studied Marketing at undergraduate level back in the last century (no, literally). Way back then content marketing was only starting to grow some vertebrae and crawl out of the proverbial water and therefore wasn't covered in my course. For the past few years I've been vaguely aware of the term and concept but didn't really get what it was all about. Until that is I read Content Marketing Primer for Editors & Proofreaders by Louise Harnby ­– an excellent introduction to content marketing. Reading the contents alone got me thinking Ooh excellent! I could do this, and this … and try this! Are you using content marketing without realising it? Louise generously mentions my self-editing your fiction manuscript course in the Primer; however, I didn’t know I was going to be in the book until I read it, and I certainly wasn't aware I was doing content marketing until she described it as such. As Louise points out in her book, many of us – editors and authors alike – are probably using content marketing without realising it, and thus not recognising its worth, or more importantly its potential. There are lots of examples of this type of content in the book, and one of the key things I’ve learned from reading it is that content marketing isn’t a highly abstract concept at all. It’s very doable and practical. ​It’s not only newbie editors who’ll find this book useful – there’s lots in it for established editors too. Louise talks about business goals and how content marketing can help us to meet those goals. It’s important to set goals when you’re starting off as an editorial freelancer, but they are equally as important for more established practitioners too. As our businesses grow, we need to review and perhaps revise these goals and set new ones. Often it’s hard to find the time to do this, especially when valued work is flowing in, but even top-level managers in large successful corporations take time out to strategise about where their business and industry is going. As small business owners, we need to take the time to do this too – I know I do anyway! ​Though I read the book in one sitting, I’ve since dipped into it a few times to review my extensive highlighting and notes. It’s an inspiring book, and it could be easy to get carried away with the number of content marketing options open to you and your business. I’ve tried to focus on one or two initial small actions until I get the time to do more. Reading this book made me ease up on myself and my guilt about not doing more marketing now – as Louise puts it: ‘content marketing is a slow burn’. This is a book you’ll want to refer to again and again, as it’s full of clickable links to some great websites and resources. There’s also a content-building framework and a free template included, which I’ll definitely be making use of to help me match my business goals with an appropriate content marketing effort. And don't worry, content marketing isn’t about giving all your ideas and work away for free – the book contains lots of examples of content you can make money from. Though I did struggle a bit with the concept of What is surrounding your content?, Louise provides a plain language definition and summary of content marketing. Overall, it’s an accessible and easy to use book. show you how to create and deliver content that will enhance your editorial business's visibility, reinforce your brand, and maximize choice regarding whom you work for and what you earn – and all within a framework that embraces engagement with colleagues and clients. Yep, it does pretty much exactly what it says on the tin! Content Marketing Primer for Editors & Proofreaders: How to add value to your editorial business is available to buy for just £3.99 from Louise Harnby’s website. When it comes to Irish literary and book festivals there's plenty to satisfy all tastes in 2017. So whether you're an author, editor or reader get out your diary and start planning your festival tour. ​Have I left out a book or literary festival in Ireland in 2017? Please feel free to add them (and their website) in the comments section below. Starting off I never imagined how my editorial journey would continue. Thankfully, my start-up years have been good ones and I’ve written a follow-up piece for The Proofreader’s Parlour outlining what I’ve been up to in terms of growing my business. Below is a short extract, but you can read the full article here. Attending an editorial conference is a wonderful learning experience. ​*Both of Louise’s books are now available in an extended omnibus edition. ​Whether you’re an author, an editor or a reader (or a combination of all three! ), you’re sure to find something of interest in this fantastic choice of literary and book festivals scheduled for 2016 in Ireland. Not only do the festivals offer readings, workshops and signings, they also offer the opportunity to make new friends, and to indulge in all things literary. Many of the festivals are currently seeking volunteers, so if you haven’t already done so, why not take the plunge and sign up. A listing for literary and book festivals in Ireland in 2017 is also available. Iron Mountain Literature Festival 7–8 October, Carrick on Shannon, Co Leitrim. Have I omitted any book or literary festivals in Ireland this year? If so, please feel free to add them (and their website) in the comments section below. This article originally appeared on writing.ie, Ireland's complete online writing magazine for authors and readers. 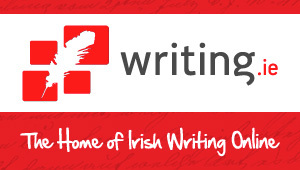 The writing.ie website features writing tips, lists of resources, interviews, publishing guides, writing courses, events and competitions, etc. ​You’ve drafted and re-drafted your fiction manuscript and all that’s left is the final proofread. No problem! Except, of course, that it’s extremely difficult to proofread one’s own work. As the writer, you’re intimately familiar with the story you’ve created, and so the challenge when proofreading is to read the manuscript as the reader would. Here are some professional proofreading techniques to help you do this. Once you’ve completed the editing stage, it’s vital to put your manuscript away for a few weeks so as to distance yourself from it. (In his book In Writing, Stephen King recommends a minimum of six weeks). Do not be tempted to go near the manuscript before then. Trust me: in terms of the ‘fresh eyes’ concept, the longer you leave it, the more mistakes you’ll discover. We read a printed document differently than we do an electronic one. You’ll be used to seeing your work on screen, so proofreading a printed version will give you a new perspective. You can make the corrections on screen in the original file, but make sure it’s the printed form that you proofread. Set the line spacing to at least ‘1.5 lines’ and the font size to 12 pt or larger – this will make the text easier to proofread. Concentration is essential for proofreading, so choose your proofreading location and schedule wisely. Find a quiet, comfortable space, free of distractions and pick a time of day when you’re at your most alert. Intense concentration is tiring, so take short breaks to give your eyes a rest. Aim for three to four hours’ proofreading a day: any longer will have limited effectiveness. There are many things to check during the proofreading stage, so it’s wise to compile a checklist: punctuation; spelling and grammar; clichés; wordiness; inconsistencies; format and styling, etc. My advice is to do a few passes, each covering a different issue. So during one pass you might check spelling, grammar and clichés. In another, you could concentrate on the format of the manuscript. Reading your manuscript aloud is a very useful proofreading technique: your brain receives the words in a different way and you notice things you might not have when reading silently. Furthermore, don’t just read it aloud: read. each. in.di.vid.ual. word and syllable. It’s a sure-fire technique to pick up mistakes such as missing words or incorrect word order. Be careful not to let your eyes skim through sentences reading what you think you see: read what is actually on the page. When proofreading, check for unnecessary repetition in your manuscript. Are you partial to the use of a particular word or phrase? If you spot it twice on the same page, for example, run a Find and Replace search on it and don’t be surprised to discover you’ve used it numerous times throughout the manuscript. And it’s not only the repetition of words you should check for and correct, but also the unnecessary repetition of imagery, ideas or actions. It’s alright for one character to have a tic (fiddling with their hair, for example), but have you unknowingly given the same tic to numerous characters? You can argue that your manuscript is a work of fiction, but that doesn’t excuse inaccuracy, which your readers won’t thank you for. So if you didn’t check certain facts during the drafting stage, then do so now. Perhaps you already fact checked, but having set aside the manuscript for a few weeks you notice something you hadn’t checked. Ensure facts relating to distances, geography, landmarks, place names, dates, seasons, etc. are all correct. A homophone is ‘each of two or more words having the same pronunciation but different meanings, origins, or spelling.’* You will be aware of many and know to look out for any misused ones: your/you’re, there/their/they’re, etc., but the problem lies with the ones you’re not familiar with. Look up any words you’re not completely sure of. The Oxford English Dictionary’s commonly confused words list is an excellent resource, and well worth bookmarking. It’s hard to keep track of all your manuscript’s plot lines, descriptions and character details in your head. Many errors in a draft fiction manuscript relate to inconsistencies in timeline, plot and character. As you proofread, keep a record of these items as they appear on the page. Note the time, date, setting and key plot points of each chapter. Do the same for your characters: note their physical description, personality traits, etc. Any chronological timeline errors or plot and character inconsistencies will soon make themselves known. I explain these tracker tools in more detail in my blog post Manuscript Management Tools for Fiction Authors. You can also download for free my Timeline and Plot Tracker and Character Tracker templates to use when proofreading your manuscript. Because you’re so familiar with the manuscript, you’re unlikely to spot every mistake – no matter how many rounds of editing and proofreading you do. So if you intend to self-publish your work, to enter it in a competition or to submit it to an agent or publisher, then it’s probably wise to engage the services of an editorial professional. You should still edit and proofread your work as carefully as possible first, because the cleaner the manuscript the less it will cost you to have it professionally edited or proofread. Wishing you all a joyful and peaceful Christmas, and a happy and healthy New Year. Thank you for visiting my blog, sharing my posts and taking the time to leave comments during 2015. See you in 2016. There are numerous writing and editing courses available to authors who want to improve their fiction manuscript in terms of the big picture issues: structure, plot, characterisation, narrative voice, point of view, pace, etc. ​This is not one of those courses! Instead, this course, which is run as part of the Claire Keegan fiction clinics series, concentrates on the micro level issues in your fiction manuscript. It focuses on the nitty gritty problems you as the author must address when fine-tuning your work. The better self-edited your manuscript is before you send it to an editor or proofreader, the less expensive the professional editing stage will be. Those considering a career in proofreading or copy-editing might also find this course interesting and informative. The correct use of punctuation, including apostrophes, commas, colons, semi-colons, ellipses, hyphens, dashes, exclamation marks, slashes and quotation marks. How to lay out your fiction manuscript, e.g. paragraph indentation, section breaks and page breaks. How to format character dialogue and avoid common dialogue errors. How to style your fiction manuscript, e.g. when to use italics, chapter headings, etc. Identifying and correcting common errors editors find in fiction manuscripts, e.g. comma splices, homophones, dangling modifiers, incorrect capitalisation of common nouns/proper nouns, and overuse of clichés, adverbs and the passive voice, etc. How to recognise style errors such as tautology and pleonasm. How to avoid timeline errors and plot inconsistencies. Wonderful course – I wish I’d found it years ago. I learned a great deal and feel I have grown in confidence. I enjoyed the course – to the point, very helpful and I will use the notes for reference. Fantastic course – really valuable. ​When I copy-edit a document or fiction manuscript for a client, I use Microsoft Word’s track changes function. This allows the author to see the changes I make to their work. The author can then decide whether to accept or reject those changes. It also allows me to comment on different aspects of their document/manuscript and to reference and cross reference my edits. Many of my clients are familiar with track changes and find it easy to use. For some authors, however, track changes is an unfamiliar tool which they must learn to use from scratch. For such clients, as well as returning a copy of their manuscript with the tracked changes visible, I also return a ‘clean’ copy – one with all the changes already accepted. Rather than reinvent the wheel, I also point such clients in the direction of some excellent existing resources that comprehensively cover the use of track changes. These provide step-by-step guidance, with useful graphics, to help my clients navigate through the edits I made in their manuscript. So if you’re unfamiliar with track changes or would like to learn more about its functionality, I suggest you read and bookmark the following online articles (including links to how-to videos on YouTube) by Liz Dexter, Janine Savage and the late Shauna Kelly. You will learn how to view the tracked changes, accept or reject an edit, make your own changes or deletions, remove comments, and to toggle between before- and after-edit views. How does Track Changes in Microsoft Word work? If you know of other good Track Changes resources, please feel free to add links in the comment section below. Thank you, and happy tracking! 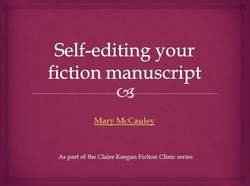 As part of the Claire Keegan fiction clinics autumn series, this September I will be teaching a course on self-editing your fiction manuscript. Some places are still available. An overview of editing your work using Microsoft Word’s track changes function. This workshop will focus on works-in-progress (short stories or excerpts of novels) submitted by participants. Manuscripts are distributed to every participant in advance and read with care by all. Claire Keegan will spend between 3–5 hours on each text, and then examine and discuss every text with the group during the weekend. Discussion likely to include the structure of a narrative, paragraph structure, time, tension, drama, melodrama, statement, description, suggestion, conflict, character, point of view, place, time and setting. The aim, always, is to help each author with the next draft. While most participants like to submit a manuscript, this is not a requirement. This workshop will focus on works-in-progress (short stories or excerpts of novels) submitted by participants. Manuscripts are distributed to every participant in advance and read with care by all. Claire Keegan will spend between 3–5 hours on each text, and will then examine and discuss every text with the group during the weekend. Discussion likely to include the structure of a narrative, paragraph structure, time, tension, drama, melodrama, statement, description, suggestion, conflict, character, point of view, place, time and setting. The aim, always, is to help each author with the next draft. While most participants like to submit a manuscript, this is not a requirement. Claire will announce details of more courses for October and November in the coming weeks. For more information on these additional courses and on any of the above, or to join the Claire Keegan Fiction Workshop mailing list please email ckworkshops@yahoo.co.uk. All places are offered on a first come, first served basis. From time to time I receive emails from people interested in becoming a freelance editor or proofreader. They ask how I set up and market my own proofreading and editing business, and they seek advice on how they might go about doing the same. You can learn more about the above steps by reading the full guest blog post. New freelance proofreaders and editors might also find Louise’s books Business Planning for Editorial Freelancers and Marketing Your Editing & Proofreading Business very helpful. If you have any additional advice for new freelance editorial entrepreneurs, then please share it in the comments below. Many thanks! There are some excellent writing courses available in Ireland this summer. Some are aimed at writers at the start of their writing careers, while others are suitable for more experienced writers. If you live in Ireland or are planning a visit here this summer, have a browse through the following selection of summer courses from Claire Keegan (various locations) and at the Irish Writers’ Centre (Dublin) to see if one takes your fancy. 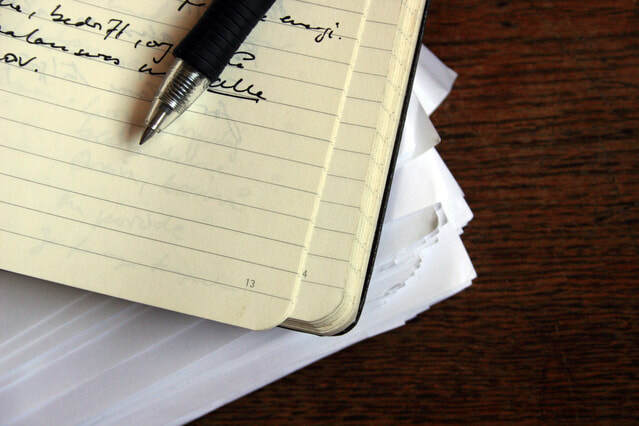 You might also be interested in attending a writing workshop at one of Ireland’s many literary and book festivals taking place over the coming months. A selection of these festivals is listed at the end of this blog post. Do you have a favourite writing class or festival that’s not listed below? Please feel free to add it in the comments section. Happy summer writing! How does time work in a scene? What is the purpose of a scene? How can a scene reveal character? And what's the difference between tension and drama? This weekend will be spent reading and watching scenes – famous and not so famous – from literature and film. Participants will be asked to select some scenes from novels and short stories. Deadline for receipt of manuscripts: 24 June. This workshop will focus on works-in-progress (short stories or excerpts of novels) submitted by participants. Manuscripts are distributed to every participant in advance and read with care by all. Claire Keegan will spend between 4–6 hours on each text, and will then examine and discuss every text with the group during the weekend. Discussion likely to include the structure of a narrative, paragraph structure, time, tension, drama, melodrama, statement, description, suggestion, conflict, character, point of view, place, time and setting. The aim, always, is to help each author with the next draft. While most participants like to submit a manuscript, this is not a requirement. Deadline for receipt of manuscripts: 8 July. This workshop will focus on works-in-progress submitted by participants. Manuscripts are distributed to every participant in advance and read with care by all. Claire Keegan will spend between 4–6 hours on each text, and will then examine and discuss every text with the group during the weekend. Discussion likely to include the structure of a narrative, paragraph structure, time, tension, drama, melodrama, statement, description, suggestion, conflict, character, point of view, place, time and setting. The aim, always, is to help each author with the next draft. While most participants like to submit a manuscript, this is not a requirement. Friday 7– 9.30 p.m. Saturday and Sunday 10 a.m. to 5 p.m., both days. This weekend will begin with a small reception and a 30-minute talk on the first draft. All participants will then write for one hour – before going on to write for two full days. You will need to come in with a first draft in your mind and/or notes taken for same. Claire will not be prompting you to write about anything in particular – the material is up to you. Most of the weekend will be spent writing in silence. It’s about making yourself get down to putting black on white, getting through your first draft in the company of others who understand the difficulties of doing so. Participants write with pen and paper. If you are interested in booking a place on any of the courses in the Claire Keegan Workshop Series, please email ﻿﻿ckworkshops[at]yahoo.co.uk. This 10-week course with Alan Jude Moore is aimed at people who are beginning to think seriously about their creative writing and want to get up and running or maybe just get back on track. Participants will be encouraged to produce new work during the course and this will provide the basis for a series of informal yet informative workshops where the focus will be on constructive critique and developing each person’s strengths and abilities as a writer. Workshops will be complemented by practical advice, writing exercises and an introduction, from a writer's perspective, to the modern literary landscape. This course, with Sean O'Reilly, seeks to develop the writer’s craft in the dynamic context of a group. It will be of interest to those who feel their stories might benefit from close reading by other writers. Participants will be required to submit their own writing for appraisal by the group as well as reading and responding to each other’s work. Over the eight weeks, participants will look in particular at the process of drafting a story; using the feedback from the group, writers will be encouraged to explore the techniques and themes in their fiction and to submit a revised version of their story. By the end of the course, participants should feel they have a better understanding of their own writing and have discovered some new approaches and tools for making it happen on the page. Want to write a book for children but don’t know where to start? Want to find out more about agents, publishers and promoting yourself as a children’s writer? In this practical, hands-on workshop with Sarah Webb, we will look at the different age groups and genres that make up the children’s book world, and then start you on your own writing journey. Time: 10.30 a.m. to 4.30 p.m. This two-day workshop is suitable for aspiring or emerging picture-book writers and illustrators and is taught by artist, writer and illustrator Adrienne Geoghegan. The course will cover a wide range of topics, including character development; how to write in pictures; genres; choosing the right language and vocabulary; pagination and word count; creating your storyboard and dummy; visual continuity and the sequential image. The course will also give answers to questions such as ‘Do I need to find a writer or illustrator for my picture book idea?’ and ‘How do I submit a “stand-out” picture book proposal to publishers?’ Feel free to bring along any work in progress to discuss in class. A successful writer must read widely, and then get writing. Participants in this six-week course with David Butler will be doing plenty of both! Along with your own works-in-progress, we'll look at examples of successful writing, focusing on areas such as: how and where to start; creating your own voice; character building; handling narrative structure; and building tension. Be prepared to discuss the work of others; it's the best way to become your own most important critic! This is a practical course with Claire Kilroy, aimed at people writing a novel, whether it’s a work in progress or a completed first draft. The focus will be on workshopping extracts from your novel in a group setting and receiving feedback. Participants will be invited to submit five extracts, each of approx. 600–800 words in length, over the course of the week. Each excerpt will be individually critiqued by Claire, and a class discussion will follow. Claire will return everybody’s manuscript marked up with her notes, and participants are expected to mark up each other's texts with their comments. As this course involves evening reading, participants would benefit from having their five excerpts in mind before the week starts, and your opening extract and a synopsis should be submitted the week beforehand. Course numbers are limited to 10. Teens will explore, with Deirdre Sullivan, different sources of inspiration for writing fiction, from books and films to personal experience. We will explore flash fiction (up to 1,000 words) and engage in a variety of exercises to get your creative juices flowing. The young writers will work on one special piece of fiction, and discover the benefits of editing and redrafting, as well as planning for stories of different lengths, from novels where world-building is necessary, to the character and narrative arc in a short story or flash fiction. Deirdre will share ways to stay motivated when working on longer projects too. If you are interested in booking a place on any of the above courses at the Irish Writers' Centre, you can book them online through their website. Some marvellous news on Caroline’s writing career: not only did Caroline go on to achieve first class honours in her MA in Creative Writing, she has just won a three-book publishing deal with Poolbeg Press! Caroline continues to be represented by the Trace Literary Agency. Click here to read more about her first book, The Ghosts of Magnificent Children, which will be released later this year. Caroline is a wonderful example of how talent, hard work and perseverance reap rewards. February has arrived and our New Year’s resolutions may be a distant memory for many of us. Was your resolution to start or progress your writing career in 2015? Are you any closer to your dream of becoming a published writer? If you’re looking for a little inspiration to help you keep that resolution, my friend and fellow Wexfordian Caroline Busher may be able to provide it. Caroline made that same decision in 2012, but she didn’t give up and she has succeeded in progressing her writing career off the starting blocks and into its next exciting stage. Caroline, can you tell us a little bit about your author journey to date. Did you always want to be an author? My fascination with books began at an early age when I would spend hours in my local library reading as much as I could. My favourite book as a child was The Secret Garden by Frances Hodgson Burnett. My love of reading inspired me to write and in secondary school I had a fantastic English teacher who nurtured my creative flare and encouraged me to write whenever and where ever I could. As I got older I continued to write, but I didn’t pursue it as a career until January 2012 when I submitted a short story to a competition and it was published. Following this, a selection of my poetry was chosen to accompany Ireland’s state art collection. Both these events inspired me to take the plunge and commit myself to becoming a full-time writer. Once you made the decision to pursue writing seriously, what first step did you take and where did it lead you? I knew that I’d have to work hard to make writing a career so I read as much as I could about the process of writing, and the craft of writing. One book I highly recommend to anyone starting out is On Writing by Stephen King. I entered the Bord Gáis Energy Book Club short story competition, held in conjunction with TV3, and was selected as a finalist. While I enjoyed writing short stories and poetry, I felt it was time to try a longer format. Writing a novel really allowed me to explore writing in a new way, as it didn’t have the same restrictions as short stories and poetry. I enjoyed developing the plot and watching the characters grow. My novel Outside The Storm took a year to complete. One thing really does lead to another and in 2014 I was awarded a literature bursary from Wexford County Council and I realised that the hard work and commitment I was putting into being a full-time writer was starting to pay off. It was great to get recognition and support from my local council; it really helped me to believe in my ability as a writer. You’re currently studying for a Master's Degree in Creative Writing in University College Dublin (UCD). Are you enjoying the course? I applied for the MA in Creative Writing as I felt I needed to learn more about the craft of writing from skilled practitioners who are successful writers and who understand what it is like to write a novel from start to finish – writers such as Frank McGuinness, Éilís Ní Dhuibhne, James Ryan and Paul Perry. I also wanted to have my own work analysed and critiqued in a constructive way by experts in the field of creative writing. Deciding to study for my MA in Creative Writing was the best decision I’ve made to date in relation to my career as a writer. I’m halfway through the year and it’s hard to quantify the amount I’ve learned; I can only describe it as accelerated learning. I could have reached the same level of learning without the MA but it would’ve taken me years to achieve on my own. It is also a unique opportunity to look at your own work more closely; it helps you to find your voice and to develop your style. One afternoon a week we invite writers and members of the publishing industry to advise us on writing and getting our work published. Last term we had Donal Ryan, Ferdia Mac Anna, Dave Rudden and Susan Stairs in to speak to us (Dave and Susan are graduates of the MA and both are successful writers). This term I’m really looking forward to other writers visiting, such as Peter Murphy who is a super, talented writer and a musician. Do you think authors benefit from studying creative writing? I highly recommend the MA to anyone who is serious about becoming a writer. Yes, it is hard work but I really believe that the time and commitment you put into the MA will pay off in the end. It helps you to edit your work – you will instinctively learn what to leave in and what to take out. You will learn how to develop characters and plot, and you will understand the importance of setting. But most of all you will be given the opportunity to push your writing to a new level, in a supportive and nurturing environment. I was delighted to hear you recently signed with the Trace Literary Agency. How did that come about? In June 2014 I attended the Date With An Agent event at the Focal Literary Festival in Enniscorthy, Co Wexford. I had ten minutes to pitch my novel to the well-respected American agent Tracy Brennan. 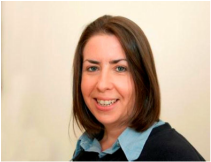 Trace Literary Agency represents clients such as the successful Harper Collins published Wexford author Carmel Harrington, as well as Terry Prone and Louise Hall. I had a sample of my manuscript prepared and had read over my work and practised my pitch before I met Tracy in Enniscorthy Castle. She appeared very interested in my work; we clicked right away and I was hopeful but also realistic. I understood it is very difficult to get agent representation, so I waited a few weeks for Tracy to contact me and when she did she asked me to send her my full manuscript. I’m pleased to say that Trace Literary Agency has agreed to represent me. Having an agent is very important for an author. There’s so much competition out there and unless you are represented by a good agency it can be very difficult to get your work into the hands of a publisher. I’m really looking forward to working with Trace Literary. Is it difficult currently to be a successful author in the publishing industry? In order to be a good author you have to work hard and read a lot. It’s helpful to know what’s going on in the world of publishing, although I was advised against writing a book based on what is popular at the moment because by the time your book is published the industry may have moved on. Instead be true to yourself, find your voice and write what you are most comfortable writing. It’s also extremely helpful, in today’s climate, to have a strong web presence, so create a blog, have a Twitter and Facebook account and use social media to your advantage. Contact agents when you feel that your work is ready and if you can, try to get your work professionally edited, as you only get one chance to impress an agent or publisher. Also, attend events and make contacts with other writers. In the three years since I started writing full-time I have made some amazing friends who are also writers. They are such a kind, helpful and supportive group of people. Have you any final advice for aspiring authors? Join a writers’ group and if completing an MA seems a step too far for you at the moment, then contact your local library and find out where the nearest writers’ group is. I am a member of a writers’ group and it helps to meet other writers on a weekly basis and to write in a group. You also get the opportunity to read your work aloud and this is something you need to get used to if you are serious about writing. Also, write every day. It may seem obvious but it is so important that you make the time to write something every day, and don’t give up. Writing can be hard: there may be criticism and knock-backs but don’t let that stop you. Just keep writing. Finally, Caroline, if you were starting again, would you do anything differently? I would have started sooner. It is a big decision to become a full-time writer, but it is one that I do not regret. Thank you for sharing your experiences and advice, Caroline. It has been a pleasure chatting with you. I wish you continued success with your writing career and I look forward to reading Outside The Storm in the near future. If you would like to learn more about Caroline and her writing, you can visit her website or follow her on Twitter. I attended my first editorial conference recently when I travelled to London for the SfEP's 25th annual conference. It was a fantastic experience and I learned so much by attending the various lectures, seminars and workshops. I met some lovely, interesting people who generously shared their knowledge, wisdom and experience and I returned home inspired and enthused. I was delighted to also share some of the knowledge I'd gathered while growing and marketing my own editorial business. In my seminar on marketing tools for freelance editors I chose to concentrate on five specific tools: customer service, brand, website, networking and social media, and I compiled a resources handout relating to these tools. These are resources I return to again and again in my own business marketing and which I share now in this blog post. These resources may be useful for freelance editors and proofreaders, independent self-publishing authors, or indeed for any freelancer or small business owner. ﻿Seven marketing tips for small business. How to build a website – #1 setup guide. Freelancers, is Facebook right for you? Are you making these 10 common LinkedIn mistakes? Can Klout help your online marketing efforts? Do you have a favourite website or blog that offers marketing tips, or have you read a great marketing book for small business that could be added to the above list? Please feel free to share in the comments below. Spelling styles are as per the original articles, hence the inconsistency between the styling of numbers, the use of both Google+ and Google Plus, etc. I was delighted and honoured to be invited by the Society for Editors and Proofreaders (SfEP) to present a seminar, Marketing Tools for the Freelance Editor, at their 25th annual conference in London this coming September. In order to whet the appetites of potential attendees, I agreed to write a blog post touching on the subject of the seminar. I hope independent proofreaders and editors will find it helpful.